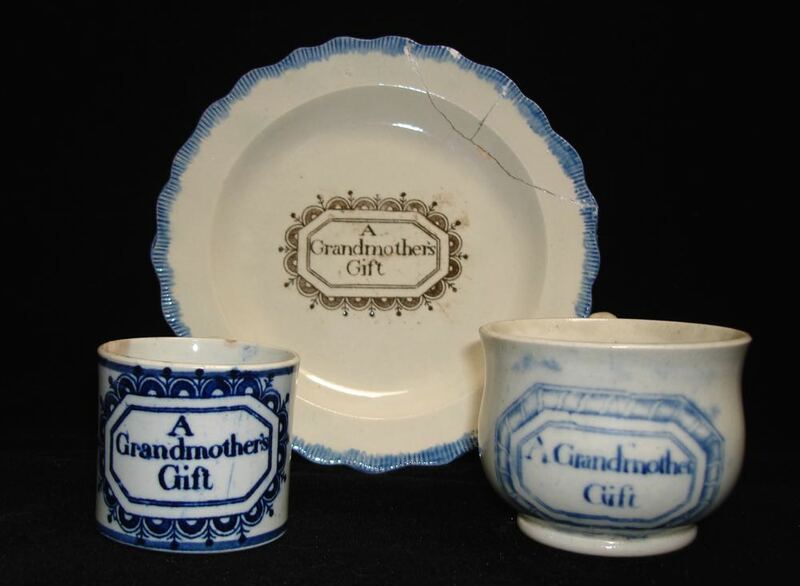 A 19th plate and two mugs that say "A Grandmother's Gift." 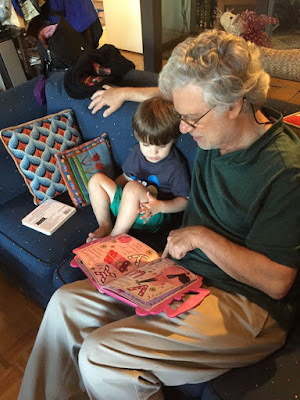 It is a busy time of year, but I am never too busy to be a grandmother! It is much easier than being a mother. Not just because you get to send the grandchildren home at night, but because all of the day to day and year to year concerns are really the responsibility of your children (aka the parents). Grandparents were the subject of many 19th century transferware patterns. However, today, unlike the 19th century, grandparents are still young (ish) at 60 and 70. 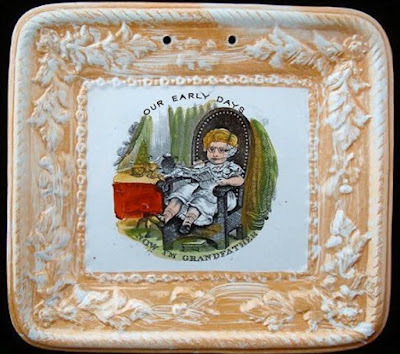 In the 19th century, grandparents were old at 45! Above, you can see three items that were obviously gifts from a grandmother. Below is a gift from a grandfather. 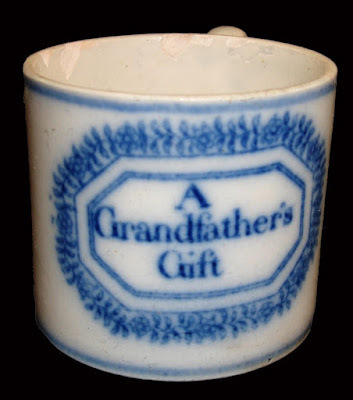 Nineteenth century 2 inch mug, "A Grandfather's Gift." I have written about grandparents before, and have shown you many photos of patterns that celebrate them: "A Grandmother's Gift and Transferware," "Happy Mother's Day," and Fathers And Grandfathers On Transferware. Most of the patterns I showed you illustrated a mother, grandmother, or father, so I thought I'd show you some more that feature a grandfather. The first five patterns below were copied from "My Grandfather," an illustrated poem by William Darton, junior, ca. 1812-1815. Grandfathers are shown doing the same loving things that they still do today. 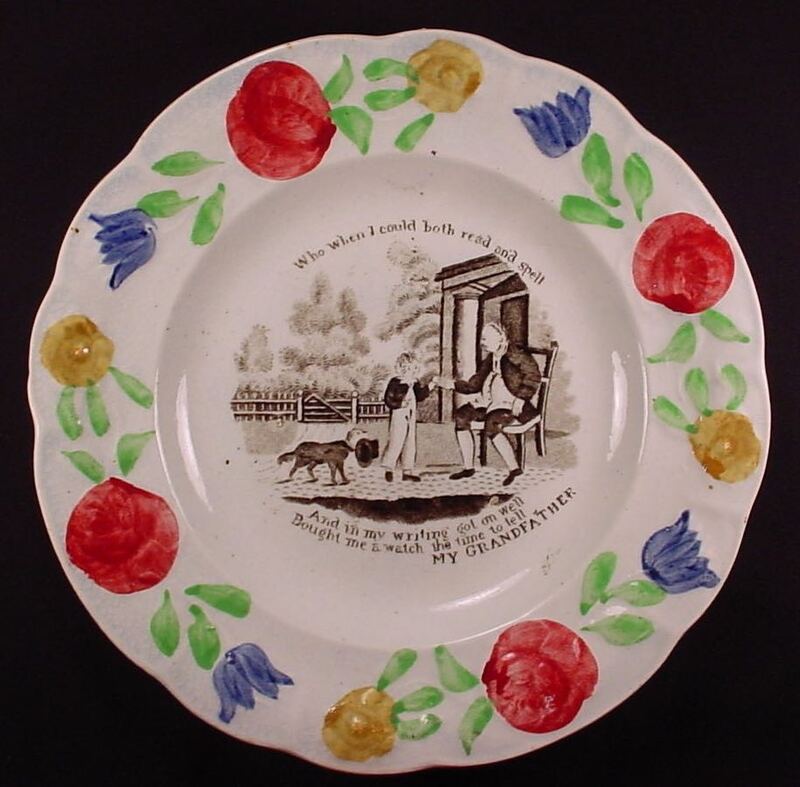 Child's plate, "My Grandfather," also titled "The Boat." The text reads: "The Boat. 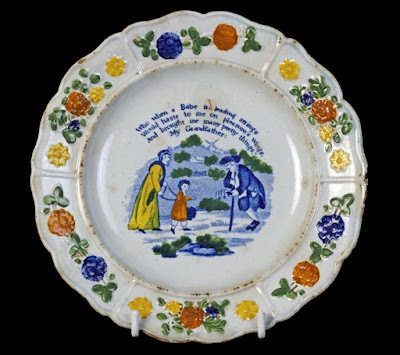 Who made for me a little Boat/ And did my joy-struck eye denote/ To see it on the water float?/ My Grandfather"
Child's plate, "My Grandfather." The text reads: "Who when I could both read and spell/ And in my writing got on well/ Bought me a watch, the time to tell?/ My Grandfather." I suggest making the photo bigger so that you can see the details (like the watch). 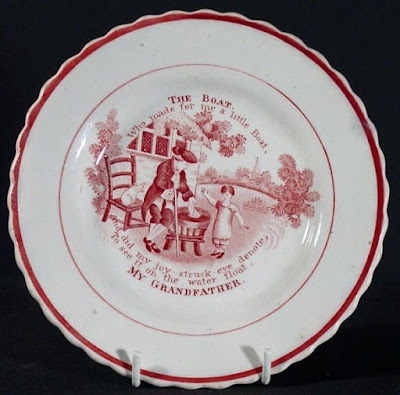 Child's plate "My Grandfather." The text reads: "Who when a Babe in leading strings/Would haste to me on pleasure's wings/And brought me many pretty things/My Grandfather." 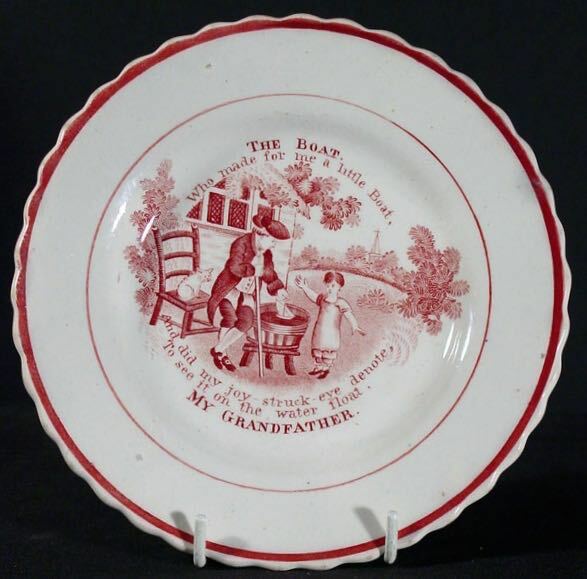 Child's plate, "My Grandfather." 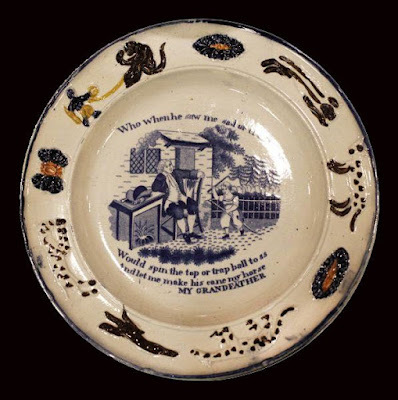 The text reads: "Who when he saw me sad or cross/Would spin the top, or trap ball toss/And let me make his cane my horse/My Grandfather." Here are two more grandfather patterns that are not part of the above series. Grandfathers looked more decrepit in the 19th century. Grandmothers too. 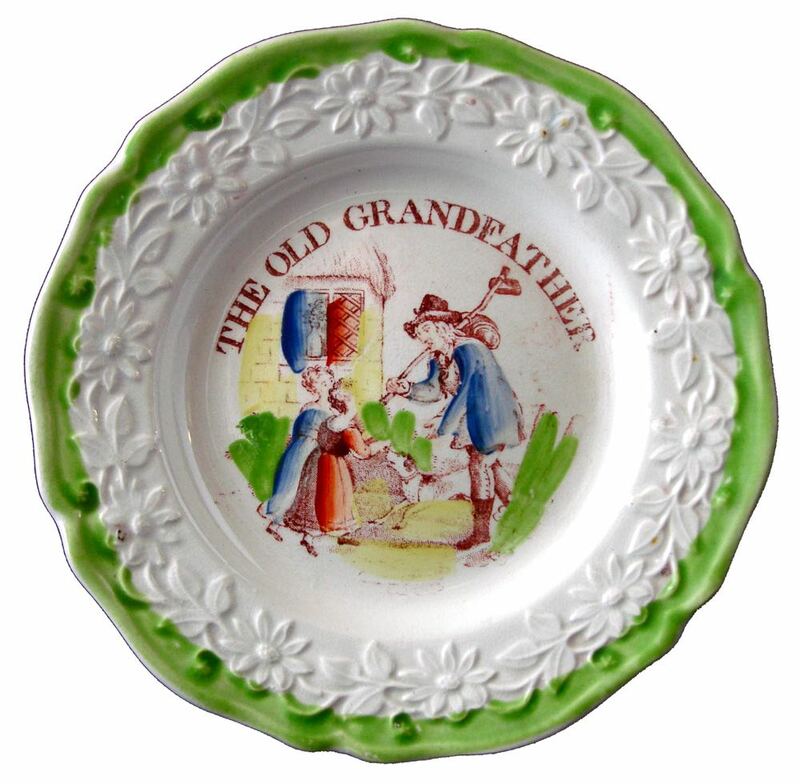 Child's plate, "The Old Grandfather." I love his luggage! 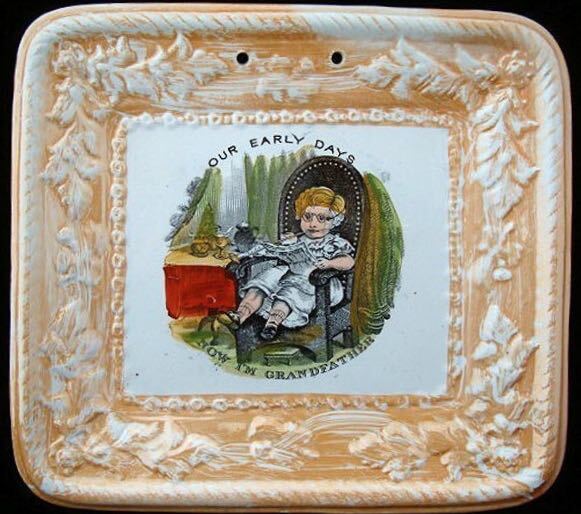 "Our Early Days" 9 inch plaque "Now I'm Grandfather" shows a child wearing glasses, reading a newspaper, and sitting in Grandfather's chair. 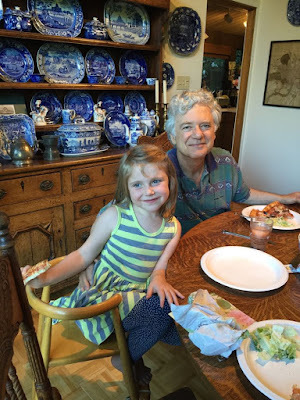 Although some things have changed, twenty-first century grandfathers are still entertaining and loving grandchildren. Grandpa and Maya at the dinner table. Notice the paper plates. Quelle horreur! 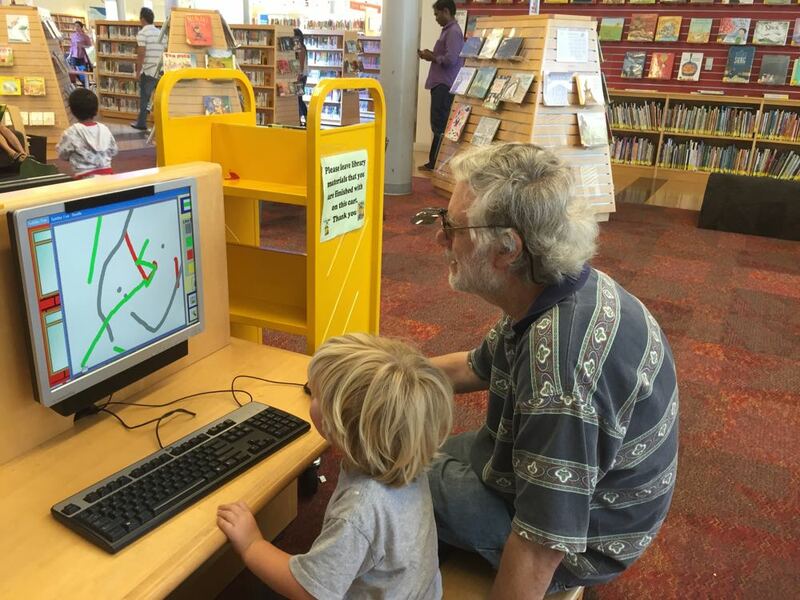 Grandpa playing with Liam on the computer.